Wide World of Sports broadcasting legend Jim McKay called Sam Posey one of the “wittiest, classiest and smartest athletes” he had ever interviewed. The folks at Lime Rock race track in the heart of the Connecticut hills like to think of him as a local hero, and are more fond of the three-dimensional mix of wood, steel and glass he produced with a pencil and ruler in 1998 that still serves as the start/finish line complex where he won a Trans-Am title in 1969. But what makes Sam Posey tick? Painter, driver, architect, broadcaster and legend, Posey is still a Renaissance man rolled into a 65-year-old body — a constant three-day festival of art, gas pedal and worldwide announcer. The fact that he still holds an enormous love for the outskirts of the industrial French city, and its billiard-table smooth Mulsanne straightaway, might say more about what he could never attain that what he did. Put simply, Posey is a man nearly as well known for what he didn’t do on the course than what he ultimately did off of it. Born in the heart of New York City 12 months and 22 days before D-Day, Posey lost his father in World War II but quickly gained a love for the American racing scene. Using his family’s prosperity, he became one of the most well-known figures in American motor sport, more as a result of his versatility and omnipresence at U.S. tracks than because of his results on them. Even if the early results were hardly overwhelming. By 22, Posey had made his first start at the prestigious 24 Hours of Le Mans, France, endurance race, driving for the Bizzarini team in a Chevrolet, only to be disqualified for crossing a white line in the pits. He would eventually finance his own cars in the Can-Am circuit and Trans-Am racing before finally falling into a win as a late replacement at Lime Rock, Conn., in what would be engineer Carroll Shelby’s last win for Ford. From that point on, from Daytona to Argentina, and most parts in between, Posey bounced around from endurance race to endurance race with cars that would either overheat, break down or get caught in bad weather. Before he was 30, he tried his hand at Le Mans, the 24 Hours of Daytona endurance race and the 1,000 Kilomentres of Buenos Aires until eventually giving Formula One a go at Watkins Glen, N.Y., in 1971, the year he turned 27. Posey beat out Dutchman Gijs van Lennep for a ride, but 14 laps later, slipping into more of the usual: a breakdown and engine failure in his Ford Cosworth V-8. A year later, he qualified quicker than the likes of F1 legends Niki Lauda and Graham Hill, but finish 12th out of 18, two laps down at Watkins Glen. He never saw F1 again, at least not behind the wheel. “Which just made me appreciate it that much more later on,” he said. 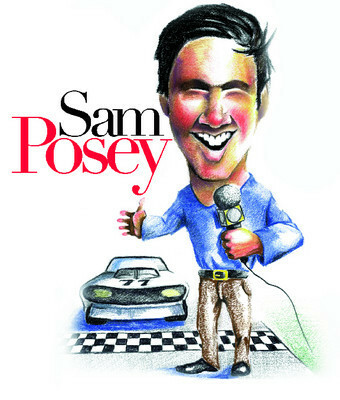 Posey went on to race in Formula A, take one run at the Indianapolis 500 (finishing fifth, two laps down but ahead of Mario Andretti), drive Formula 5000s and the Sebring, Fla., 12-hour endurance event. In the end, racing became secondary, with Posey a victim of sponsorships that dried up, cars that gave up and checkered flags that were few and far between. It was time to really shine, an “afterlife,” Posey called it in an interview shortly after his retirement. And the racing afterlife turned out to be a good one. Throughout most of the 1980s and ’90s, his voice became synonymous with Indy 500 telecasts on ABC, alongside Jim McKay, Paul Page and American legend Bobby Unser. Popular and accessible among car clubs and organizations, he became a regular keynote speaker and helped his son John begin a racing school. He earned a solid reputation and even took home an Emmy, Posey’s voice hardly fading as Indy drifted further and further away from the mainstream. But the afterlife also meant many other things. In 2001, he was singled out in a Washington (D.C.) Art Association exhibit for his move into printmaking. He was involved in commentating the grueling 2,000-plus-mile Tour de France cycling race and even wrote a book on model-train building. Look in the racing history books and Posey will be there. Look across the track at Lime Rock and you’ll know Posey was there. Look in an art museum … he was there. Jason Stein is a feature writer with Wheelbase Communications. He can be reached on the Web at www.wheelbase.ws/mailbag.html. Wheelbase Communications supplies automotive news and features to newspapers across North America.